Agencies are introducing events and activities to recognize Black History Month (BHM) and the accomplishments African-Americans have made to society. Allen & Gerritsen and hometown newspaper the Boston Globe are hosting "Racism in Boston: Where Are We Now?" on February 26 to serve as a follow-up conversation to an agency forum that launched a discussion last year. Horizon Media's internal diversity & inclusion team is introducing the agency's fullest slate of BHM programming that included a kickoff event in partnership with NAMIC (National Association for Multi-ethnicity in Communications) that brought together black talent from NYC-based media agencies to network over games, drinks, and music. In addition, series creators of the Sip & Listen with Black Girl Podcast will produce an episode of their podcast live at the agency, with a networking happy hour afterward. A fireside chat with BET’s chief brand officer Vince Hudson will focus on why diversity and inclusion should be considered a business imperative for all organizations, and how agencies can contribute to moving the needle forward in this issue. To continue the celebration, Horizon will also play music by black artists every Friday, distribute t-shirts/sweatshirts with quotes about black culture and pride and launch a social media campaign that shares the black experience by those working at the media agency. 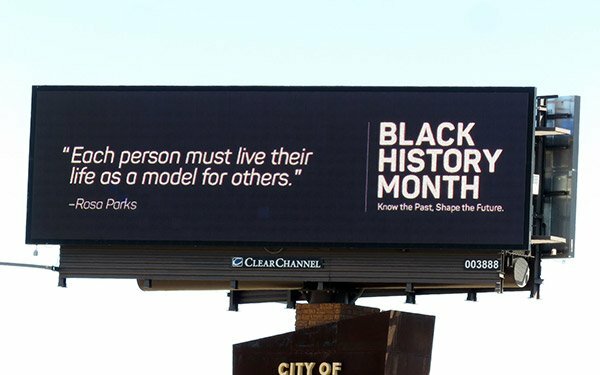 Clear Channel Outdoors is running the Rosa Parks quote "Each person must live their life as a model for others" on available space across the CCO's digital network through Feb. 28. The Havas network is activating its annual #BLACKATWORK experiential activation with this year's project serving as a mirror of the "creative expression that exists and that which is still to come," says an agency spokesperson. Three U.S. offices, in New York, Chicago, and Arnold in Boston, will host the interactive experience, as well as raise funds for Black Girls Code to promote equity and representation. Havas is also developing partnerships with black-owned businesses, influential black artists and Diversity and Inclusion Networking Groups within the industry to host additional events and discussions. Wavemaker is introducing the second annual ART NOIR exhibition that celebrates diversity across a variety of art forms, including graffiti, digital art and photography. Part of the agency’s RQTEKT series, this all-agency event enables Wavemaker employees to express and explore their personal passions alongside professional and emerging talent. Deutsch’s diversity, inclusion and culture committees are putting together several experiences at its New York and Los Angeles offices. The agency's NY office will host a panel conversation on Tuesday, February 26th to address topics such as microaggressions, code switching at the office, and mentorship. The agency's Los Angeles office is hosting an art installation, an Afrobeat dance class taught by employee Ene Obeya, and is switching the lobby soundtrack to feature black artists across all genres. In addition, every Wednesday in February from 1pm-4pm, 15 students from the city's Dorsey High’s Radio, TV and film class will visit Deutsch and learn about advertising and connect with Deutsch mentors.